Preschool and Kindergarten is the perfect time for children to learn Spanish, but for most families and schools this is difficult because they don't speak Spanish and they don't have a good curriculum to follow. Progressive Language can help! 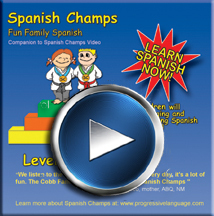 Preview the Spanish Champs Level 1 and 2 resources and the three learning kits we offer by watching these short videos. The video on the left is for Level 1 and the right is Level 2. Not sure which kit is best for you or if you are ready for Level 2? Take a look at a comparison of all the Spanish Champs kits and see the criteria to help you judge if you are ready for Level 2 by clicking this button below. If you want a more detailed look at each of the Spanish Champs individual resources, please scroll down and click on each image to take a look inside where you will find free samples. "After vast research I've come to the conclusion that your curriculum fits my actual school ages perfectly. I'm so glad that I can use your Spanish Champs curriculum in my class. It is simply awesome, let me congratulate you." "It is a definite advantage for our children to learn Spanish, and Spanish Champs does a great job introducing it in a fun and developmentally appropriate way!" "We love the songs and DVDs. Our students are engaged and responsive. Parents are delighted to see that their children are learning Spanish. We will be interested in any other materials that you produce." Click Image to see a full sized flyer. 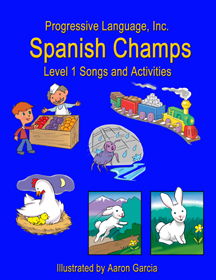 Spanish Champs resources are the perfect way to get children singing and speaking Spanish fast. CDs and DVDs are available in two levels. Kids will learn essential Spanish, including: greetings, colors, food, clothes, numbers, manners, animals, family, the alphabet, key action verbs, commands, descriptive adjectives and much more. Spanish Champs resources are available as individual components, or bundled together in kits that offer discounted prices. 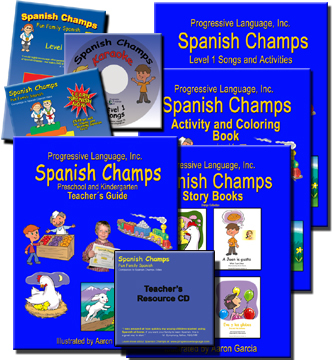 Progressive Language created the Spanish Champs preschool and kindergarten Spanish program and offers a complete curriculum kit with everything needed to launch a successful Spanish program. Teacher's Manual and Resouce CD. The Resource CD includes 150 printable images, 4 printable stories, certificates of achievement, and optional assessment tests. The curriculum is intended to be repeated more than once. Each pass through adds additional activities and builds greater comprehension and Spanish abilities. The Spanish Champs Preschool and Kindergarten Spanish program was developed by professionals and classroom tested in programs with over 300 preschool children. Spanish Champs is now used by around the globe, including the US, Canada, the UK, Australia, Puerto Rico, Bermuda and other countries. Preschool and Kindergarten Curriculum Kit and get started with Spanish now! The illustrated Song and Activity Book for Level 1 has been two years in the making and includes details of how to use each song to learn Spanish. This book is an excellent resource for children, parents and teachers. Beautifully illustrated and full of great learning ideas, using this book will accelerate Spanish comprehension as you learn motion to all Spanish Champs Level 1 songs. Click the song book cover to see inside. Click the CD cover to see a video with Spanish Champs songs and associated drawings from the song book. The Teacher's Guide provides detailed lesson plans for a 32-week Preschool or Kindergarten Spanish program. Each lesson includes a minute by minute plan on exactly how to teach, a variety of suggested activities to reinforce the lesson, and a send-home activity. This guide it what ties together all Spanish Champs Level 1 resources into a fun and dynamic curriculum. Included with the Teacher's Guide is a Resource CD that includes 30 printable images that are used in class, certificates, assessments, and four printable stories. Click the image of the Teacher's Guide to look inside. Each of the 23 Level 1 Spanish Champs songs is illustrated with black and white drawings and ready for coloring. This book also contains 16 activities that can be done at home or in the classroom to reinforce each of the 16 units in the curriculum Spanish. Click the image of the Activity and Coloring Book to look inside. Spanish Champs Story Books Four beautifully illustrated stories that tie in perfectly with the Spanish Champs Preschool and Kindergarten program. The chicks are missing and the mama hen is looking here and there for them. The chick are lost and are cold and hungry. When the mama hen finds them, they settle down for a good night sleep. Find out what food Juan likes as you learn food and eating vocabulary. A fun and simple way to learn about your body and body vocabulary. David is sad, but Eva has lots of balloons to cheer him up. Learn colors, feelings and verbs.